Spice Village is a group of white washed bungalows with thick elephant grass thatched roofs and large verandahs all around. The bungalows are scattered around the Village's luxuriant spice gardens, many of which are used in the resort's kitchen. The resort has limited room service since it is spread out over eight acres. However, the buffet meals are lavish affairs with vegetarian and non-vegetarian dishes. The meals are laid out in the resort's dining room. All around are handmade tables and benches made from rubber wood. There is another restaurant, The Tiffin Room, with its more than a hundred year old antique rosewood furniture. In addition, there is a well-stocked bar. At the centre of the village is the swimming pool and there are facilities for badminton, table tennis and a host of indoor games. The hotel has a resident botanist to answer guest's queries about the wide variety of trees and spices around. Rooms : 52 private cottages. Cuisine : Multi cuisine, three dining areas, Tiffin Room and cookery classes. Built on a verdant land unscathed by modernization, the Shalimar Spice Garden is a perfect blend of European and Indian living without diluting the rich heritage of Kerala. The resort merges with the spice gardens that encompass it, is the verdant landscape bordering the Periyar Wildlife Sanctuary. 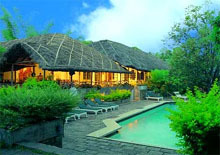 The architecture of the cottages is a fusion of Indian concepts and Western comfort. With its natural environment and ambience, Shalimar is the perfect place to be, for you to get closer to nature. The pace of life here is so easy and peaceful that even the birds and the butterflies do not seem to be in a hurry. The gentle mountain stream meanders through the property and a wooden bridge built over the stream connects the resort to the outside world. The lush foliage of the coffee, cardamom and other spices plants surrounding the cottages provide privacy for each cottage. From Trivandrum/ Kovalam (255 kms- 6 hours), Cochin (185 kms- 4 1/2 hrs) and Madurai (140 kms- 3 hrs). The nearest railway station is Kottayam (100 kms- 3 1/2 hrs). The resort is built in a typical Kerala hillside village style. It is a set of cute cottages nestling against the bacHotel Treetop is an escape into an idyllic world of peace and quiet. The hotel comprises neat little gabled cottages and rooms with tiled roofs reminiscent of the Raj bungalows. At down-to-earth prices, superb service and warm hospitality, Hotel Treetop has to be savoured at leisure. The hotel also has an independent bungalow with a self-contained kitchen, living area and bedrooms that can accommodate four families comfortably. Each cottage has its own private sit-out from where one can see birds, sambar or wild boars. The rooms have cable TV and direct-dial telephone facilities.The multi-cuisine restaurant of the hotel offers a range of delectable dishes. In addition, the hotel organizes water safaris on the nearby Periyar Lake, nature treks of adjacent spice plantations and Ayurvedic massages by trained masseurs. Access: From Cochin International Airport: 145 km; Thrivananthapuram: 230 km; and Madurai Airport: 148 km; Madurai Railway Station: 135 km; and, Bus Stand : 4 km. Magical canopy of dense- thick- green forest, the Periyar wildlife sanctuary,is one of India's best tiger reserves. Below this thick green canopy roam herds of elephants, sambars, tigers, gaurs, lion tailed macaques and Nilgiri langurs. Famous for its virgin greenery, diversity of wildlife and scenic beauty, the reserve promises visitors a spectacular getaway. Lush green forests, cool breeze and abundant wildlife beckon you to the Green Woods Resort, Thekkady. Treat your aesthetic senses with the breathtaking beauty of Thekkady, while your mind takes a break from the mundane. Green Woods is located on a quaint hill, surrounded by spice plantation, besides being just a stone’s throw away from the Periyar Tiger Reserve. Drive up the winding road, straight into the heart of Green Woods, and remember to leave your watch behind-because time simply stops here. Apart from ensuring that your holidays are the best ever at Thekkady, Green Woods is also your best choice when it comes to mixing work with play. The expansive Conference Hall at Green Woods ensures that your official meetings and discussions are conducted in style, with the latest technical back up. Additionally, if you love to take a dip, Green Woods has a refreshing swimming pool with a Jacuzzi that will invigorate your mind, body and soul. Alternatively, you could also visit the Recreation Centre, Mini-gym, Curio Shop, Library or the Badminton Court. If you have kids, head to the Children’s Play Area. Green Woods also has other essential facilities such as Doctor on Call, Travel Desk, Safe Deposit Locker and Internet Cafe. Green Woods have come up with plunge pool villas, a unique tree house accommodation the VANYA. • A tree house nestled in 8 acres of thick vegetation, next to the Periyar Tiger Reserve. • Pure Nature- as it is and as it should be. • Breathtaking view of Mountains and Valleys. • Let the adventurer in you take over-Tree house can be accessed only through trekking. • Be ready to welcome Indian Bisons, Boars, Deers and Elephants who might give you a surprise walk-in, accompanied by the musical cacophony of crickets and nightingales. • Let your lungs feast on the oxygen and your olfactory nerves enjoy the exhilarating aroma of nature. • Quench your thirst with sweet natural spring water. • Being eco-conscious, the only energy sources are Solar and Wind generated. • Get close to nature and enjoy the sumptuous local cuisines consisting of sweet potatoes, Tapiocas and yams. • A person at your beck and call, all through your stay. Plunge pool villas - 02 nos. Vanya - the tree house - 01 no. The Resort dream location, unhurried style, and the attentive concern to hospitality never fail to leave lasting memories. Set in beautifully landscaped gardens against green-clad mountains, each of the simple yet stylish cottages present the finest in the modern living Cardamom County Plantation Theme Resort is set amidst lush forests surrounding the area known as Cardamom County. The resort provides a variety of accommodation ranging from deluxe cottages to a suite cottage. The deluxe cottages are well-appointed and are modern in look and features. The cottages are all on a height and the private balconies have some of the best views of the Kumily Hills and the forests of the Periyar Tiger Reserve. The Resort believes in service and old-fashioned hospitality. Each of the rooms has large bathrooms with bathtubs. Rooms : 32 villas with thatched roofs, built on stilts. Aanavilasam Luxury Plantation House is a new (2009) plantation house on 7 acres of private estate. (Just 8 km from Thekkady (Periyar wildlife sanctuary) It is surrounded by a pristine Cardamom and Pepper plantation.Owned by Salim Pushpanath a photographer and publisher in Tourism. As a vacation retreat, this property gives the sensation of an exotic far away destination without the hassle of traffic. Luxuriously appointed yet casual and welcoming, this is a boutique accommodation suited for individuals, couples, or small families in search of a personalized country retreat. The contemporary classic design includes two suites, both appointed with a luxurious bed and linens. Both suites are individually styled and have an elegant country-house feel where comfort is paramount. Natural fabrics, like Indian linens, cottons, wools and silks add to the feeling of understated luxury. A stylish fireplace and book shelves in the main living room and the dining area connect the two suites. The spacious suites offer 600 square feet of indoor space. French doors open onto an oversized private living room with views of the surrounding hillsides and cardamom plants. The suites feature a king sized bedroom and separate living room with a generous seating area, work desk, dining table, and pantry with refrigerator. Both suites feature a veranda and spacious bathrooms with separate showers, double vanities, large garden bath with romantic touches such as bath oils and candles. Refreshingly cool, neutral walls provide a calming backdrop for the eclectic mix of international styles that have been featured within the homestead. A general Plantation Theme is featured throughout the estate, and is subtly echoed in the interior décor. The rooms open onto stunning wrap-around stone tiled verandas with sweeping views of the estate. Hospitality is generous and abundant, and our staff is willing and able to be flexible in order to meet everyone’s needs and desires. Hotel Blooming Paradise invites you to stay where the emerald green forest wearing the Diamond Water Garland, and fill their morning cup of tea with the most cherishing experiences and entertainments. Blooming Paradise, a much awaited delightful get away theme based hotel, is on the bank rocks of Periyar lake, Thekkadi. Rangerwood Nature Castle is a true window to the wild. In the resort, each window opens to the wild life. Away from the urban rushes, Rangerwood offers you a true holiday. 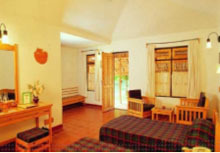 The cottages are spacious and well furnished with all the modern amenities. Located close to the entrance of Periyar Tiger Reserve, Thekkady. Rangerwood Nature Castle have over 40 years experience in tourism industry. widespread greenery and animal world around. Not only the sights but a crisp and clean air tones up even thoughts and bring forth a renewed body, mind and soul.